Over 62 million persons visited the Orlando area in 2014, mainly attributable to the sustained and growing popularity of the Walt Disney World and Universal Orlando theme parks and resorts. As these theme parks grow and seek to reinvent themselves, foreign and domestic buyers are seeking to capitalize on Orlando’s positioning as the “tourist capital of the world” by purchasing and investing in vacation rental homes near the resort areas. With the help of international travel agencies such as Virgin Holidays and CVC Brazil, Orlando’s vacation-oriented real estate market has been opened to investors all over the world. In addition, vacation-oriented real estate in Central Florida is generally viewed by foreign buyers as a safe investment for their assets. This sentiment is evidenced by rapid growth in vacation home sales in Orange and Osceola Counties, as sales volumes have surpassed pre-recession highs set in 2005. 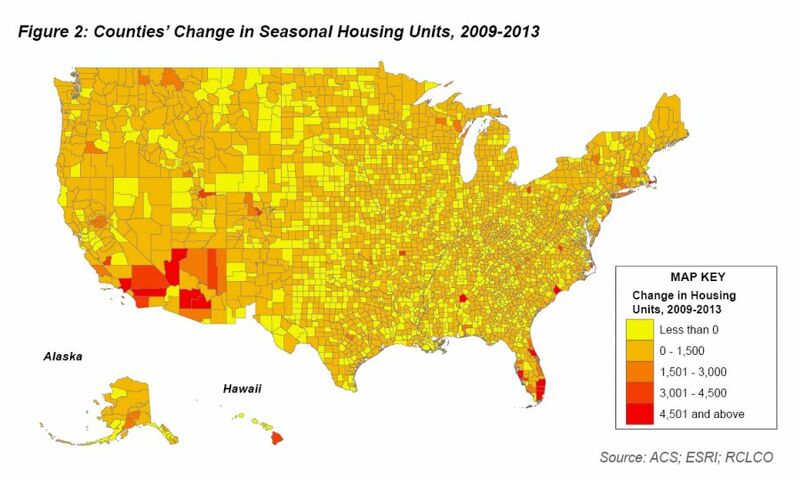 However, the market has not fully recovered for all vacation-oriented housing types. Condominiums, and particularly condominium-hotels, lag behind the rest of the market in regards to both sales price and volume. Overall, the vacation real estate market is strong in Orlando, with 2014 sales up 100% in Osceola County and 325% in Orange County over 2008 lows. As a whole, the vacation-oriented real estate market has made a strong comeback in Orange County, and sales have exceeded pre-recession highs set in 2005, growing at a compounded annual rate of approximately 27% since 2008. Most of this growth is attributable to single-family detached vacation home sales, as condominium sales volumes still have not recovered to pre-recession levels. 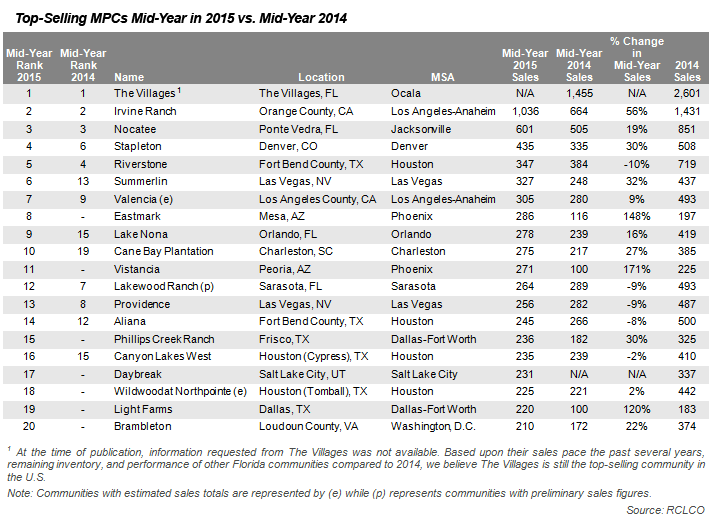 Furthermore, in 2014, over 70% of condominium sales were under $150,000, compared with less than 40% in 2005. Although single-family detached vacation home sales have also seen a significant increase in the proportion of sales below $150,000, these sales are more distributed among other price bands, and the share of sales among homes priced over $500,000 actually increased. While the vacation real estate market is smaller in Osceola County than it is in Orange County, a similar trend can be observed. Sales volume in Osceola County has grown at a more gradual pace of 13% annually since 2008, and real estate achieves a discount, on average, to Orange County. Like Orange County, the large majority of sales in the county are attributable to single-family detached units, and the condominium market still lags behind the single-family market. Although the year is not yet over, Osceola County has experienced particularly high growth rates in 2015 among vacation real estate sold for over $1,000,000, with the highest percentages since before the recession: over 30% of vacation-oriented condominium sales, and 3% of vacation-oriented single-family detached sales, were in this price band. While single-family detached vacation home sales still tend to skew toward the under $150,000 sales price band, an increasingly greater share of sales has been observed among units selling between $150,000 and $500,000. Sales in the $300,000-$500,000 price band, where the “meat” of new home sales have occurred in the county, have experienced a three-fold increase in their share of all single-family detached sales. In general, while the vacation real estate market has made a full comeback with regard to sales, higher shares of those homes are being sold at lower prices. In general, new single-family vacation homes in Orlando’s “tourist corridor,” the area of southwest Orlando near Walt Disney World and Universal Orlando, are selling between the mid-$300s and the mid-$400s, with well-amenitized communities, such as ChampionsGate and Reunion, achieving top-of-market sales prices. 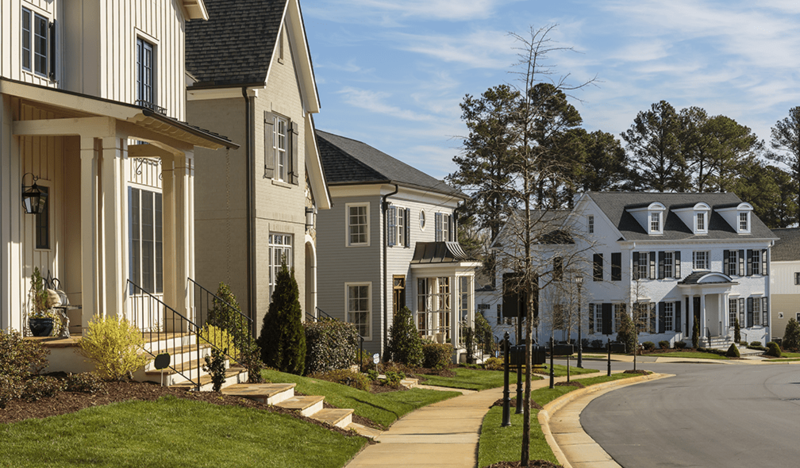 Communities offering larger single-family homes—six bedrooms and above—have also been able to achieve sales prices above the mid-$400s. Further evidence that the vacation real estate market has recovered is the sales pace achieved by the largest communities in the area. These developments have been able to achieve absorption rates of seven sales per month, on average. The condo-hotel market peaked in 2006, and sales volume is still well below peak levels. Sales volume increased slightly between 2010 and 2012 as the Central Florida housing market began to emerge from the recession, but this trend was short-lived, as sales volume has waned over the past few years. Much of this lagging activity could be attributed to a lack of recent deliveries, especially when compared to traditional forms of real estate. Local developers tell us that obtaining financing for condo-hotel projects can prove more difficult than for single-family home projects. The Osceola County condo-hotel submarket is significantly smaller than that of Orange County, and as a result has seen less market activity. Condo-hotels did not comprise a significant portion of Osceola County’s vacation real estate market until 2005, when development activity began around the Reunion and ChampionsGate resorts. After an initial surge in sales activity, the market quickly tapered off, and has shown little sign of recovery. An uptick in sales activity in 2014 seemed to indicate that the market for condo-hotels was beginning to improve, but sales have returned to more modest levels this year, indicating that the market has still not accepted condo-hotels as a proven investment property type. It is still too early to see if the condo-hotel market will make a full comeback in Orlando, as several developments that were proposed during the recession have still not shown signs that they will be constructed. Despite the historical trends in Orlando’s condo-hotel market, many investors and developers are confident this market will recover. International and “absentee” buyers are attracted to this type of real estate because there is little to no maintenance that is associated with owning condo-hotels, other than paying for management, cleaning, and furniture replacement costs. Condo-hotels are generally viewed as safe places for international buyers to keep part of their savings while also earning modest returns. Earlier in 2015, a new condo-hotel development, ph Premiere, was announced that is looking to reset the market for condo-hotels in Central Florida. In addition, the 300-acre MargaritaVillage Resort is planned in Osceola County and projected to open in 2017. It will contain retail, hotel space, condos, and single-family homes for vacation rental. Many investors and brokers point to the Floridays Resort as one of the most successful developments in the Orlando market. Citing good management, well-maintained units and common areas, consistently high occupancies, and excellent traveler reviews on sites such as TripAdvisor, brokers often recommended buying a unit in Floridays if an investor wants to purchase a condo-hotel unit. The vacation rental market in Central Florida is dominated by foreign buyers looking for a safe place to park their cash while having an opportunity to earn a return on their investment. Buyers from South American countries such as Brazil have flocked to the relative safety of investing in single-family vacation rental homes in Orange, Osceola, Lake, and Polk Counties known as the “Four Corners” area near Walt Disney World. In addition to South American buyers, citizens of European countries such as England, Ireland, Germany, and others are investing in vacation rental homes. Potential investor returns can vary widely depending on the community in which the home is located. Newer and more robustly amenitized communities such as Reunion and ChampionsGate tend to fare better than older communities or those with fewer amenities. Local brokers who specialize in the vacation rental market indicate that if you are going to invest in a vacation rental home, Reunion and ChampionsGate are the best choices. Other factors that drive potential investment return include the number of bedrooms, occupancy rate, average daily rate, and expenditures such as housekeeping, lawn maintenance, utilities, and community fees. Also, in addition to the purchase price of the house, an investor can expect to spend upwards of $50,000 on furnishing the home, and these furnishings typically need to be replaced at least once every seven years. Most vacation rental homes are between five and nine bedrooms. Encore at Reunion is a new community that plans to offer homes with up to 13 bedrooms. Homes with more bedrooms generally offer the potential for a greater return on investment through economies of scale. 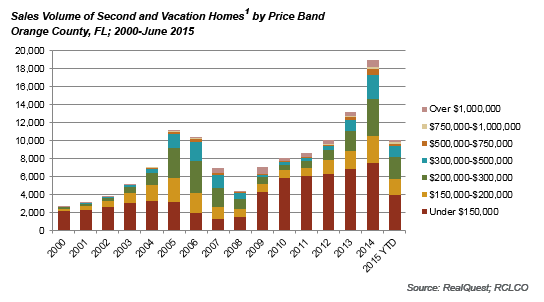 Most purchases of vacation rental homes are cash purchases. Overall, in the Central Florida market an investor’s goal for return on investment with a 60% occupancy rate on homes between five and nine bedrooms is approximately 5%. This level of return is very attractive for many foreign investors, especially those from South America who are seeking to escape rocky economies, shaky political situations, or falling currency exchange rates. In addition, many investors take their home out of the rental pool for several weeks each year to use for their personal vacations. Finally, over the long term, investors have the chance to gain a capital appreciation return as well as an annual operating return. 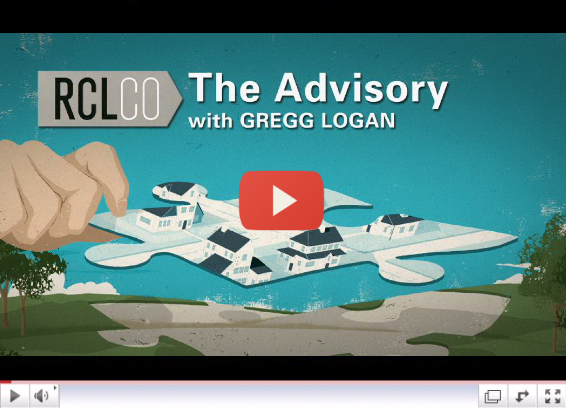 Article and research prepared by Gregg Logan, Managing Director; Brian Martin, Vice President, and Ethan Tabakin, Associate.